going to Home Depot & Lowes. Love the smell of fresh cut lumber! well... let's just say I could be there for hours. & bumped into a big old stack of delightful nubby burlap. Burlap is great for so many designs. wrapping pots of herbs, lining the back of a bookshelf, etc. A huge 7' x 7' piece was just $3.98. for making into drape panels or using on a table. though it would be easy enough to sew them to your desired size. The pretty pink blooms are from one of the trees in our driveway. They are a perfect foil to the rustic texture of the burlap. So lovely for an evening garden party. It's been a busy week here this week and I am a bit behind on my visits. My middle guy will become an upper class guy (11th grade) tomorrow..
that I am old enough to have kids so big!! There are 12 blogs partying along together in one ENORMOUS blog party! Each will have a suggested theme AND GIVEAWAY!! oohh I am soo excited!! joining the party and the rules for entry into the giveaways! Thanks Vanessa & Heather for organizing everything! Conspicuous Style shared fantastic paneled walls~ love it! 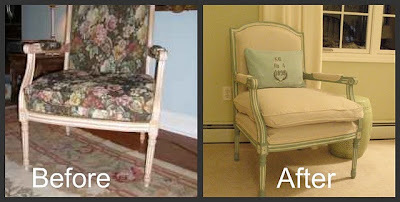 Love Judy's chalk paint chair over at Diy by Design- so gorgeous! 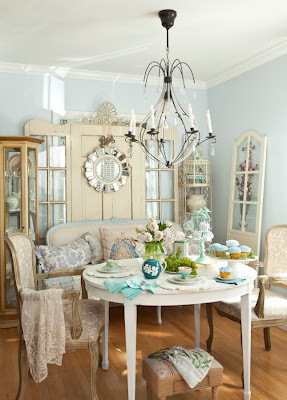 Maries Maison shared her newly re-styled again home- so pretty! Designed to Dwell shared her charming secretary desk. Grab a button if you would like! decorating, flea finds, designs, crafts, table settings, etc. Thanks for the tip! I will be heading to the Hardware Store this weekend. ~ especially the fabulous french "wine bucket" basket, did you see the dome and picnic basket from that line too??! I did not know they had burlap at Home Depot. Nice to know and it is larger. Thanks for hosting. Perfect for the garden, very charming! Don't you just love styling your new table? It looks sensational with the pink flowers against that burlap! Geat Photos! Courtney I'm rushing off to the Home Depot with my fingers crossed in hopes that they still have some burlap left! What a great deal! So perfect on your table! I think we all have a touch of burlap love! Thanks for being the gracious hostess! Hi Courtney! Oh, your table looks pretty. It has never dawned on me to buy burlap at Home Depot or Lowes...I just get it at the fabric store. Thanks for the tip. Hope you have a good weekend! Did you get your camera situation figured out? I too love going to Home Depot and Lowes. But I love burlap even more! Just bought burlap curtains to hang in my family room. They have smocking at the top. Can't wait to get them hung! Hi Courtney. Thanks for having me today. I haven't joined in with a blog party for ages...yours is the first one after my bloggy break. I am so happy to be here. Lowe's is one of my favorite places to hang! You can wander those aisles for hours! What a great deal you got on that burlap! It looks fab on your table! I'll be keeping my eye out for some next time I go. Thanks for hosting such a fun party! Hi Courtney, Thanks for that tip. Now I'm off to Home Depot to buy burlap . . . who would have thought? Your table looks beautiful! Lovely features this week. Thanks for hosting. Love your party! I love your burlap on the table!! Lovely table and thanks for the tip. I so enjoy your parties ~ thanks for hosting! Thanks so much for showing this burlap. I would love to pick that up for some drapes. What a great cheap way to change things up for summer. Thanks for having us over. I love my trips to Home depot and Lowes too. Thanks for sharing your inspiration, and for hosting Courtney. I put on the brakes while reading and had to go back - that beautiful burlap came from Home Depot! Sure hope my local HD has it - it looks simply marvelous! Beautiful setting for an outdoor party! The burlap looks fabulous outside! I'll have to keep my eye out for it at HD. 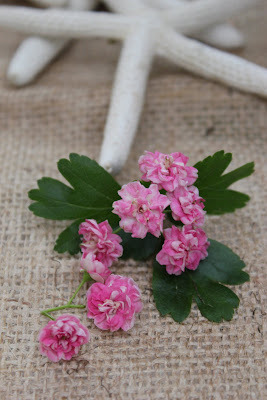 The burlap and the pretty pink flowers looks so perfect together. Thanks for hosting! I love burlap and starfish and roses! What's not to love here? And your post was so beautiful (as always) I had to pinned it to my pinterest. all linked up for another fun friday...have a wonderful weekend my party friend! Your table looks so pretty with the burlap and flowers. Thanks so much for the tip! I sure love a nice stroll through Home Depot too! Your table looks so pretty and what an awesome deal on your burlap. Have a great weekend Courtney! lots of great weekend project inspiration here!! Oh Courtney, you are my kind of woman. I'll take tramping around HD and Lowe's over Bloomingdale's any day. I love the POSSIBILITIES in those stores; I want to try everything. The burlap looks good -- 50 years ago my Mom fashioned summer placemats for us from burlap -- fringed 4 sides and zig-zagged to keep them from fraying -- her friends thought she was nuts. I still have a few of them! Home Depot here I come! Can't wait for your blog party! Thanks for hosting this party this week! Thank you so much for the feature. You made my day. I am all linked up again. Looking forward to "co-hosting" the big blog block party with you. It should be great. Great Hoe Depot purchase! I was there yesterday eyeing a greenhouse window someone special ordered and did not pick-up.....reduced price.....has some possibilities! Thanks for hosting FNF. Your table looks great! I do not have much to contribute this week...been busy with college forms for eldest daughter. I just re-accessorized an end table. OMG Courtney. So many great links. I'll be on my pc half the night tonight. Have a great weekend! I love the burlap on your Farmhouse Table. 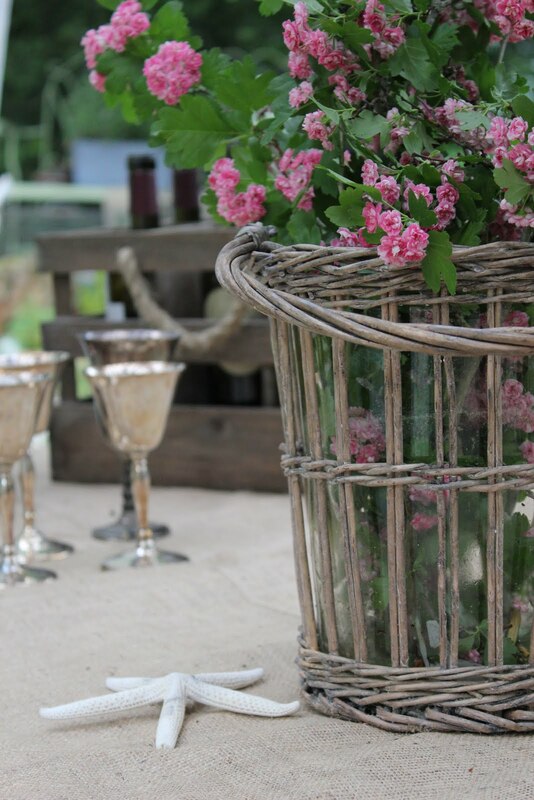 The Flowers, in the vintage inspired baskets are so pretty! Children do grow up too fast, especially through High School, four years just go by in the blink of an eye. Hi Courtney darling! Thanks for the shout out...you're really a star! Happy weekend GF. ME TOO!!!!!! I am addicted to those stores!!!! Thank you for inviting me to link up! I have to go past Lowe's coming and going and its hard not to stop all the time. I always find something when I stop in. I love your burlap on your table. Thanks for hosting your party. Hey, Courtney! Love your table. That was news to me too about HD carrying burlap! Thanks! Hi Courtney! I can't believe you are old enough to have a hs grad and an 11th grader! My daughter is going to be a senior. Sniff. Sniff. I was trying to find your button code to add to my home page under "where I party." Thanks Courtney for dropping me a line about my collages. I checked out your blog and it is so pretty. I joined as a follower so I can read more of your posts. y looking at the pics you really have some great things. I love the look of the burlap on your table-very pretty table setting too. I was just looking for ideas for a tablecloth this morning! Yours is perfect! The links are incredible this week! Thanks for stopping by my blog! I too am a home improvement store girl. I did not know about your linky party and will be sure to come back for the next party. Thank you so much for hosting ans personally inviting me!!! you are too sweet! Your farm table and table setting are inspiring....so beautiful! Ohhhh, I love going to Lowe's too! Have a lovely weekend! Great find on that burlap sheeting! I've seen it at Home Depot myself and wondered if it might have project potential. 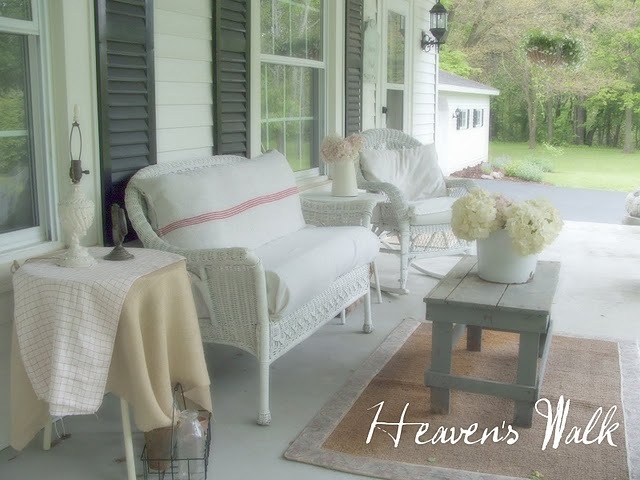 I saw some really cute burlap pillows on Belle Escape not too long ago and would love to have some rough grain sack type cushions on our patio furniture. Alas, I really want to redo our patio all together- so I think that project will have to wait, but thanks for rekindling my inspiration! Thanks for the tip on buying burlap. Very helpful information. And I'm right there with you on my love for Home Depot and Lowes. I'm even contemplating getting a job at Home Depot ... may still happen. Thanks for hosting! Everything is sooo beautiful as always! And I'm feeling the same way about my children/school. My oldest (who is studying in Milan/Arezzo right now) is 17, about to be 18, and to finish up school this year/go off to college for real/all those auditions/applications! WHEN did I get old enough for that to happen? I like to tell everyone I had her when I was 9. I turned the big 40 just a few months ago, so I suppose I AM old enough to have a college student! Thanks SO MUCH for stopping by my little blog. I LOVE your blog to pieces! YOU ROCK!@!!! Loved the burlap and all the useful ideas for it. HD is a wonderful source for so many great finds. I love their drop clothes...nubby and neutral for so many great things like outdoor drapes, pillows, etc. ; very inexpensive and really wide widths. Check out Ballard Designs for their great burlap bedskirt. Thanks for the tip on buying burlap from Home Depot...LOVE! Thanks for stopping by Elizabeth Ann's and for the invitation. I linked up, I guess "better late than never". I enjoyed looking around French Country Cottage. I signed up to follow so I can keep up with all that's new. I would love it if you would follow Elizabeth Ann's. Thanks for the burlap inspiration! I can't wait to try it as a tablecloth! Love your blogsite...And thanks again for having the linking party. I have been inactive for a while. I just read this neat blog about the burlap. It certainly made for a beautiful and creative table. I always enjoy visiting your blog. Hopefully I can catch up on my visiting as well. Thanks for the tip on the super-cheap burlap, Courtney! It looks fabulous on your farm table! I'll have to check and see if they carry it at my local HD here in NC. Fingers crossed they do! I didn't know you could get it that wide---thanks for the great tip!